Centromeric protein that plays a central role in the incorporation and maintenance of histone H3-like variant CENPA at centromeres. Acts as a specific chaperone for CENPA and is required for the incorporation of newly synthesized CENPA molecules into nucleosomes at replicated centromeres. Prevents CENPA-H4 tetramerization and prevents premature DNA binding by the CENPA-H4 tetramer. Directly binds Holliday junctions. 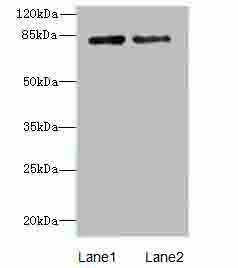 HJURP Polyclonal Antibody. Unconjugated. Raised in: Rabbit.